In the last issue we looked at getting started with in-the-round carving and many of the basic principles are the same when approaching relief carving. As long as the tools are kept sharp, they are essentially no different. Holding the timber is different however and can be done by clamping onto a simple bench top or using a large bench hook. 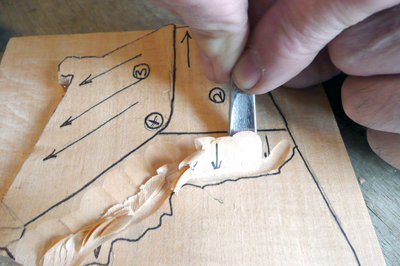 Most carvers will find a suitable method depending on their circumstances. First of all, we need to be sure what we mean by a relief carving. Carvers seem to have varied ideas about this - some feel that anything with a flat back is correct, irrespective of how deep it is and how much of it is actually carved in-the-round. Others think that it describes anything carved out of a thin piece of wood, no matter what the shape is. I subscribe to the third opinion, which is that a relief carving is one that has a flat background and involves a degree of foreshortening and/or perspective. The subject is given the illusion of depth by skilful use of these techniques, which creates the appearance of being carved from a much thicker piece of timber. In my view, if there is no illusion or foreshortening in a carving, it doesn't really become a relief - it is a flat-backed carving in-the-round. The carving can be very thin, forming a shallow relief of similar style to the pattern on a coin, or it can be quite deep, meaning that the subject can be very nearly, but not completely, the correct thickness or depth. The degree of perspective or foreshortening involved will obviously be greater the thinner the original piece of wood was to start with. I would stress that this interpretation is only my opinion and others will have their own views. I have not found any definitive description of exactly what this type of carving should be, so until I am convinced otherwise, I will go with my current thinking. Unlike carving in the round, where you can start carving with only a fairly rough idea of what your carving will be, with relief you really need to have decided pretty much everything you wish to include in your piece. 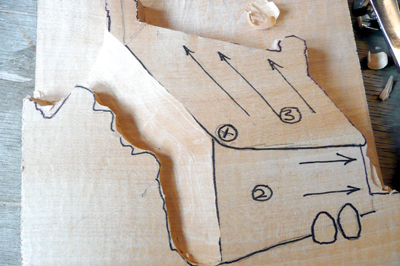 At least you need a detailed drawing of the carving you are starting so you can transfer this to your timber. There is one technical point here that we cannot really overlook - the place of vanishing points when using perspective. Any design that includes horizontal lines, particularly like those in buildings, will involve vanishing points of some kind. 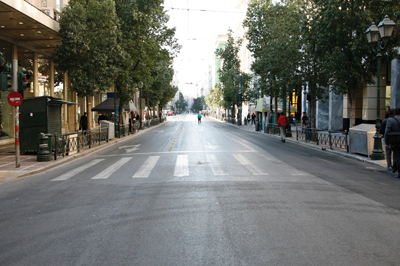 A picture can generally have one, two or three points of perspective, depending from which point it is viewed, meaning that it will have more than one vanishing point. The carver should check with all horizontal lines and see where they meet. This may be at a single point or more and may be within the picture or outside it. Wherever these points are in your original picture, they should be the same in your carving or the final result will not look right. I have seen some very well-carved relief carvings where the carver has got the perspective very wrong, often with conflicting and confusing vanishing points. Once you have an understanding of how perspective can affect a picture, any deviations can scream out at you, making the picture very wrong. Once the design is decided upon it needs to be transferred to the timber; here is where most novices encounter their first problem. They painstakingly draw their pattern onto the surface of the timber without considering that they will very quickly be cutting off all their lines. Worse still, they start the carving very carefully trying to retain the lines they have drawn, losing almost any chance of getting any depth into their work. I always advocate drawing your pattern onto a clear acetate sheet with a very fine permanent marker pen and only transferring the outline of your pattern onto the block at the beginning so you can see where you need to remove wood for the background. By putting location marks on your block and sheet where you will not be carving you can always locate the pattern in the same place to check your design. 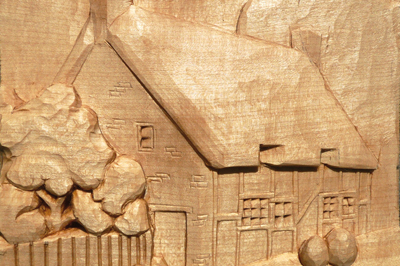 You may have heard the expression that relief carving is done from the back. What this means is you need to remove the bulk of your waste material to establish where the deepest part of your carving will be and work forward from there. This way, you know exactly how much wood you have available and will make the best use of it, avoiding what I see so often, all the detail in the first 6mm or 12mm and no real appearance of depth. The drawing of each section of your carving can be transferred from the acetate to the wood by laying it over the wood and drawing underneath. In order to cut round this detail I advise using a veiner rather than a chisel or V-tool as you will cause far less damage and avoid breaking away. 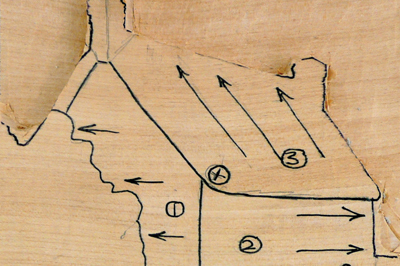 Once you have a channel around your outline, you can cut round with a chisel or shallow gouge to get a vertical edge from your outline to the background causing minimal damage. There is nothing worse than seeing half-moon cuts in the background of a relief from careless edging. Always be aware of the grain direction when doing this. 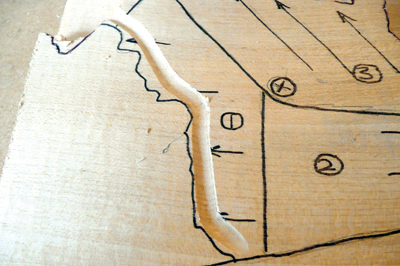 Cutting obliquely across the line of the grain will avoid creating splits along the edges that cause important pieces to break off. You may even be able to leave a small amount of extra wood on the background as a safety measure and then clean this up in the final stages. Once you know how much wood you have to play with you need to study your pattern and sort out where all the angles are and carve these as well as you can without including any detail. You will probably find it very helpful to draw this detail using your acetate to check whether you have got these angles right. It is at this stage that you should be making any adjustments to your design to get the correct perspective and foreshortening. Any experimentation should be done by drawing with your pencil not with your carving tool. You are actually drawing a relief with a pencil and giving it some depth with your carving tools and shouldn't lose sight of this. This process is best done by standing your carving upright and stepping back from it to view the effect. You might also like to consider where it is likely to be displayed and from which direction the light source will be coming. The success of a relief carving can actually come down to how effective the use of shadows has been and these cannot be easily seen when the carving is lying flat on the bench. Once you are happy, use a gouge or V-tool to mark the boundary of the bushes, then a wider, flatter blade to pare down the side elevation of the house. Remember to check regularly to make sure the perspective is correct.